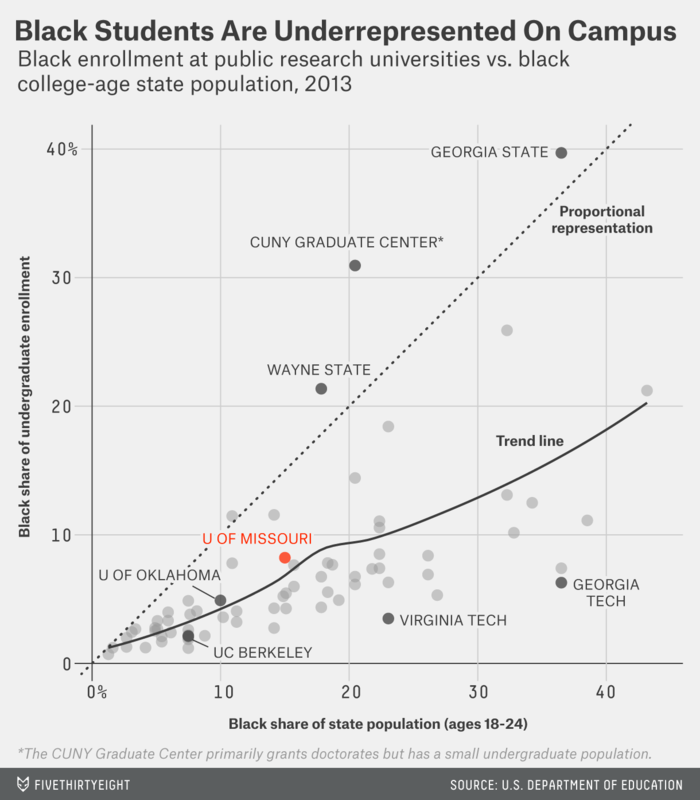 Blacks are underrepresented at universities nationwide. University of Missouri students, during a campus forum in Columbia, Missouri. Thousands of college students across the country on Thursday joined protests demanding that their schools do more to address racism and discrimination on campus. Students at many campuses are calling for an increase in the diversity of faculty and more resources to help minority students succeed. The data suggests that they have a point: Colleges across the country are far less diverse than the communities they serve. The protests began at the University of Missouri, where top administrators resigned Monday following weeks of student strikes and demonstrations, and at Yale, where students have engaged in public verbal battles with faculty over racial insensitivity. At Claremont McKenna College in California, student demonstrations and a hunger strike forced the dean of students to resign Thursday. At Ithaca College in upstate New York, students are demanding the resignation of the college’s president over his handling of racial issues on campus. And colleges across the country are scrambling to schedule forums, convene task forces or find other ways to address rising student unrest. It isn’t surprising that the protests have spread beyond Missouri. On Thursday, we looked at the demographics of the University of Missouri’s flagship campus, in Columbia, and found that African-American students, faculty and staff are all underrepresented there compared with the share of African-American residents in the state overall. Also, graduation and retention rates are lower for African-American students than students of other races. But Mizzou is no outlier on these measures. We looked at 2013 data from the U.S. Department of Education for four-year universities with heavy research activity,1 a proxy for the selective schools that are Mizzou’s peers. We excluded historically black universities and colleges (HBCUs), which have much higher black enrollment and skew the overall figures. At most of these schools, like at Mizzou, African-Americans are underrepresented relative to their share of the 18- to 24-year-old population in the state where the university is located.2 This is true regardless of region, and the difference in the percentages tends to widen in states that have a higher percentage of black residents. Mizzou — where 8.2 percent of undergraduates are black, compared with 15 percent of the state’s college-age residents — is almost exactly in line with its peers in terms of how representative its student body is. Even across all high-level research universities (including public HBCUs), blacks were underrepresented compared with the overall young adult population in every state except West Virginia. Here, too, Missouri was pretty much in line with other states. Racial disparities are even larger at private colleges, where many of this week’s protests have taken place. At Yale, home to some of the earliest and most intense demonstrations, just 6.7 percent of undergraduates are black, compared with 14.9 percent of college-age residents in Connecticut; in New Haven, where Yale is located, the college-age population is about 25 percent black.3 Private colleges, especially elite schools like Yale, draw students from across the country, so the state or local population isn’t necessarily the best benchmark for comparison. But top private universities are only modestly less black than equivalent public ones.4 Perhaps surprisingly, nonprofit private colleges as a whole are no less diverse than public ones, while for-profit colleges are substantially more diverse. The picture is a bit different on another important measure of college diversity: graduation rates. The racial gap in college completion — the percentage of students who earn a bachelor’s degree within six years of enrollment — is wide across the country and is particularly stark at top universities. But the University of Missouri’s flagship campus did significantly — though not dramatically — worse than the national trend. This statistic has notable limitations. It doesn’t include part-time or transfer students, although such students make up a relatively small share of the undergraduate populations at elite schools like Missouri and Yale. Other factors can also skew the numbers; students in the military, for example, can get called to duty, delaying their graduation in the process. And of course, students could graduate in more than six years, although the longer it takes to finish college, the less likely a student is to earn a degree. Top private colleges, though they enroll fewer black students, do a somewhat better job of helping them graduate. At private, nonprofit research universities,5 85 percent of African-American students graduate within six years, versus 90 percent of all students, according to the Department of Education data. At equivalent public universities, the gap is wider: 57 percent of African-Americans students graduate, versus 72 percent of all students.6 (For colleges of all research levels, there is less difference between public and private schools.) Of course, private schools are often more selective in which students they admit, which makes it hard to interpret their higher graduation rates. As we’ve said previously, it doesn’t appear that the racial gap in graduation rates is narrowing. Some of that is due to the disparity in college readiness. Still, the wide disparities in both enrollment and completion are a national issue that goes beyond any one campus — and they will likely need to be addressed if protesters and administrators are going to find common ground. Specifically, schools with “very high research activity” as determined here by the Carnegie Classifications. State demographics are based on 2013 population estimates from the U.S. Census Bureau. According to the American Community Survey. Using the same “high research activity” designation. These rates are calculated from the individual institutions’ graduation rates, weighted by the number of undergraduates (or, in the case of black graduation rates, black undergraduates).